Vulnerable children around the world need a voice. Could that voice be yours? Adoption Advocates play a vital role in connecting a waiting child to family. Family adoption stories, specific special need Facebook groups, blogs about parenting a child with a SN, organizations that champion a specific special need are all perfect examples of how advocates can use their voices to bring these amazing children home. With the recent addition of over 2,200 children from China’s Shared List, RainbowKids will soon have over 6,000 waiting child profiles. Dozens of children are being added daily. To meet their needs, every child needs personal advocacy. The Child Advocacy Network (CAN) creates a direct bridge between advocates and a waiting child. It is an inclusive system that gives every child the greatest opportunity to find their forever family. 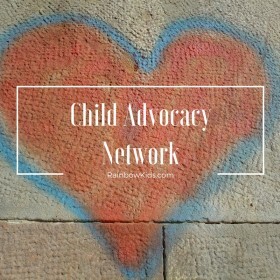 How Does the the Child Advocacy Network (CAN) Work? CAN connects advocacy groups for specific medical needs with vulnerable children waiting to be adopted that have the same special need. Example 1: LA Kelley, an organization specializing in educating families about Hemophilia has no affiliation with adoption. However, they do have a strong connection to families who are currently parenting a child with hemophilia. As a member of the CAN, LA Kelley now receives an email instantly when a child with Hemophilia is added to the RainbowKids website. This email contains a short profile and link to the child's listing that LA Kelley then shares with their network of families through their website, social media and e-newsletter. Example 2: A dedicated adoptive mom of a child born with Hemophilia runs or is an active part of a Facebook group that advocates for children with this disorder. She is dependent upon adoption agencies finding her group or other families informing her of children who need her advocacy. As a member of CAN, she will now instantly receive a "child advocacy alert" email whenever a new child with Hemophilia is added to Rainbowkids. Example 3: Some organizations, such as Little People of America, have an established adoption advocacy program. As a CAN partner, LPA has instant notification of children with Dwarfism that become available for adoption, and are put into contact with the adoption service providers that are representing that child. We've built an inclusive system that gives every child the greatest opportunity to find their forever family. Because nearly every Intercountry Adoption Agency in the United States uses RainbowKids to list their waiting children, CAN is uniquely positioned to act as a central location to connect children needing families with organizations and individuals willing to advocate and help find families! CAN is all about making new connections to benefit children waiting for families. It also brings attention and promotion to the organizations who partner with us. Commit to advocating for children with a specific special need OR older children or those in a sibling group? Network through social media to advocate for these children? Seek out resources and family resources that will encourage families as they explore adopting a child with a specific special need? For all who advocate for these precious children, thank you!